Almost one in two (45%) of women dreams of starting her own business; however, only a small percentage (12%) will take steps to make this dream a reality. Economics: insufficient financial support (49%) and an unequal economic situation (43%). The METRO International Own Business Study, “Women & Own Business,” divulged a number of revealing insights regarding female entrepreneurs. Given the number of members of the coming generation — iGeneration — planning to become entrepreneurs or engage in some form of self-employment, these statistics come at a critical juncture in time. As a wholesale cash-and-carry group based in Dusseldorf, METRO relies on connections with core consumers to achieve success. Female entrepreneurs represent an eager, untapped market in METRO’s backyard. METRO gave each baby girl born in Dusseldorf on International Women’s Day her first business card, which doubles as a fixed deposit worth 2,000 euros (the average cost to start a business in that area). The cards can be redeemed on the child’s 18th birthday. METRO’s survey discovered that the majority (80%) of survey respondents advocate for governmental programs assisting female entrepreneurs, so the surveyors decided to take matters into their own hands by taking the first step. METRO’s actions allow it to build early equity with future consumers and their families. The company operates on the cash-and-carry system, which relies on direct interactions and relationships with business personnel. By establishing a personal connection with these young girls early on, METRO can establish itself as a supportive player during a potential partner’s formative years. METRO’s survey revealed that business owners believe it to be 10 times more difficult for women to start a business than for men. The fixed deposit positions METRO in a positive light as a benevolent protector — well worth the euros invested if the young benefactors do decide to become business owners. As the fourth-largest company in the world (by revenue), these actions add a humane element to corporate organizations often perceived as heartless and uncaring. Don’t just inspire change — create it. "There are still too many barriers that keep women from realizing their business ideas. This comes at a significant cost to the economic development. With our campaign, we want to motivate the next generation of female entrepreneurs. The business cards and the associated starting capital are our promise to support entrepreneurial women and help them to be successful on their way to their own businesses,” explained Heiko Hutmacher, chief human resources officer at METRO AG. Establish a tradition of service. — Consumers’ desire for brands associated with causes is old news: Two-thirds (66%) of consumers expect companies to be associated with a philanthropic or social effort — a number that rises to over 80 percent when examining Millennials and iGeneration consumers. These associations no longer serve as a distinguishing factor that differentiates one brand from its competitors. Brands need to establish a role as long-standing contributors to social good and to transform one-time actions into a core aspect of their identity. Be genuine. — The calendar is riddled with holidays and “International Day of” occasions. Brands often feel pressure to participate in the dialogue to remain timely or out of fear of the negative repercussions following their silence. Numerous brands attempted to create material for International Women’s Day in the interest of appearing supportive to the current political climate and garnering earned media. The New York Times attempted to build on its “Truth Has a Voice” successes with a new installation, and McDonald’s attempted to join the conversation by flipping its arches. Both launched to mixed reviews, based on the nature of their operations — not the specific campaigns themselves. The negative impressions they earned far outweighed those had they stayed silent or engaged in practical, long-lasting change. Create a tangible impact. — METRO did the legwork. It could have gone the traditional route — raising awareness — and published results on its website as a packaged PDF full of charts and graphs detailing the problem. Instead, the brand set the precedent and did what it was tasking other governments and organizations to do: take action. 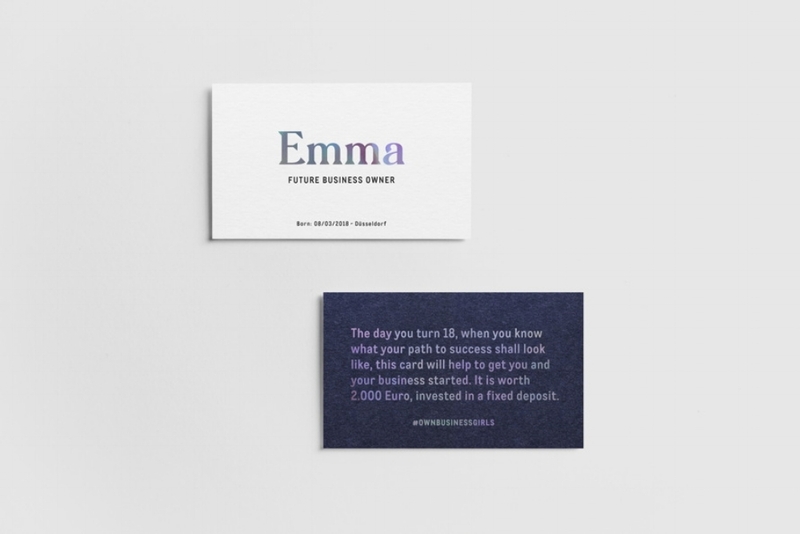 By developing individualized business cards for each child, METRO created a unique and concrete connection between an abstract philanthropic effort and its actual impact. This allows METRO to build a personal connection between the girl, her family and the company. Millennial women - likely the mothers of these girls - place heavy value on entrepreneurship: a majority (83%) want to own their own business and more than half (58%) consider it the most interesting career path.